We have extensive experience in the landfill sector having worked within landfill companies and as consultants for operators. This experience has involved us in many facets of the development of sites from planning application stage, through to design and Construction Quality Assurance. Construction Quality Assurance is an important element during construction ensuring liner, drainage and capping systems meet planning and licensing requirements. Our service includes auditing of raw materials, supervision of installation and preparation of Quality Assurance reports. We routinely undertake geotechnical assessments of materials including on site testing (density, permeability, moisture content) during the construction phase. We are able to provide a dedicated, professional team at all stages of development and in particular provide resident engineers and construction quality assurance professionals to ensure landfill construction progresses in accordance with design. 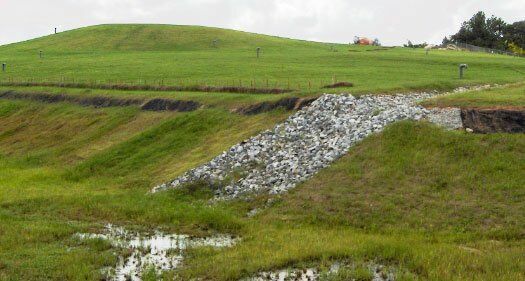 Landfill permitting and design requires a multidisciplinary approach involving geotechnical engineering, geology, construction quality, civil engineering, hydrogeology and risk management. Earth Environmental & Geotechnical provide a wide range of Landfill services, click here to contact us for further information.